Decently crafted and executed black metal with an affinity for lush progressions and airy synth lines lurking below the surface, but one cannot help but wish the rather thin production matched the depth in the sound this band is trying to uphold. This and the fact that the synthetic drums help in sucking out any organic atmosphere that Xerion hopes to achieve, leaves “Cantares das loitas esquecidas” feeling a touch barren of that much needed emotional connection on a sonic level. Trying to get past the overall sound, the music holds up rather well on its own, being empowered by tasteful harmonies and very interesting twists in the music without losing sight of memorable structures. The vocals remain harsh throughout and even though Xerion are meddling with more harmonious elements ala the increasingly trendy “Viking” metal movement (Like pitch singing in the form of choral backgrounds and aloof riffage), they use these elements sparingly and never lose the underground black metal core of their songwriting style. Being from Spain has seemingly given them a unique perspective as they manhandle a noticeable Norwegian BM influence and make it their own. 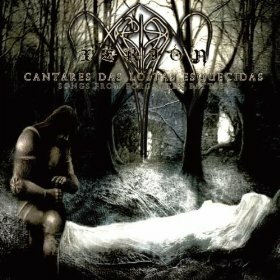 One cannot help but wonder how much more impact “Cantares das loitas esquecidas” would have had with a real drummer and a studio recording more adept at capturing the true essence of Xerion’s sound. Still… a well written release worthy of closer inspection. ~ by martyworm on November 23, 2010. This entry was posted on November 23, 2010 at 4:59 am and is filed under ALL REVIEWS, X-reviews.You can follow any responses to this entry through the RSS 2.0 feed.You can leave a response, or trackback from your own site.